This past April, the President issued Executive Order 13792 (Review of Designations Under the Antiquities Act) which puts national monuments under review for alternate uses that may include mining and natural resource extraction. I received notice yesterday that the public comment period for Executive Order 13792 has opened up. It appears the comment period for Bears Ears is 15 days only (one of the last two federal designations by President Obama). Looks like the President and his administration want to remove federal designation from this monument as quickly as possible. Comments relating to other national monuments are open through July 9. This entry was posted in Environment, Politics on May 16, 2017 by johnnyjquispe. As the presidential election dawns up on, tens of millions across the country will be casting their vote for the next president of the United State of America. This election has been quite the headache for many and concerning for others with the rapid emergence of non-political discourse coming from the Trump campaign and supporters. It is time to come together to ensure that we do not allow this kind of hate speech, unbecoming behavior, polarization, and ineptitude to have a seat at the table. Yes, I’m with HER. I’m with her because she is the most qualified individual to run for office and will work day in and day out to ensure the future of this country! Tomorrow, at 6 a.m. when the polls open you best be sure that Trump supporters will be showing up at polls to cast their vote. That means that we have to show up at the polls as well! New Jerseyans… I’m looking at you! Yes, New Jersey has a 99.9% chance of going to Hillary…Yes, voting might take some time, but it is necessary to go out and vote to dispel any illusion of “rigging” and to provide America with a clear victor! Find out the two ballot questions for New Jersey! Permits casino gambling in two additional counties in this State? At present, casino gambling is allowed only in Atlantic City in Atlantic County. Only one casino in each of the two counties would be permitted. Each casino is to be located in a town that is at least 72 miles from Atlantic City. The amendment would allow certain persons to apply first for a casino license. A “YES” vote supports allowing the state legislature to pass laws allowing for two additional northern counties to each have one new casino, thereby ending four decades of casinos only being permitted in Atlantic City. A “NO” vote opposes this amendment to establish additional casinos in New Jersey. My recommendation? Vote NO on 1! The casino industry has not been successful for some time… so what’s going to change now? The proposed plan is to have a multi-million dollar casino built in the Meadowlands. While it provides temporary jobs in construction and running the casino it will also cause Atlantic City Casinos to close down and cost thousands their jobs. Provides that an additional three cents of the current motor fuels tax on diesel fuel, which is not dedicated for transportation purposes, be dedicated to the Transportation Trust Fund. In doing so, the entire State tax on diesel fuel would be used for transportation purposes. The entire State tax on gasoline is currently dedicated to the Transportation Trust Fund and used for transportation purposes. The amendment would also provide that all of the revenue from the current State tax on petroleum products gross receipts be dedicated to the Transportation Trust Fund. In doing so, the entire State tax on petroleum products gross receipts would be used for transportation purposes. This amendment does not change the current tax on motor fuels or petroleum products gross receipts. A “YES” vote supports this proposal to dedicate all revenue from gas taxes to transportation projects. A “NO” vote opposes this proposal to dedicate all revenue from gas taxes to transportation projects. My Recommendation? Vote YES on 2! The gas tax is in effect and New Jerseyans are feeling it. Whether you agree with the tax or not is a separate issue, but you now have a say in how the money is used! Voting YES on 1 ensures that the gas tax revenue will go towards transportation infrastructure (roads, bridges, bike lanes, etc.) instead of plugging holes in the general budget other purposes. Ask your friends and family (text and/or call) if they are voting! If no, encourage them to vote! Offer to take them to the polls or accompany them if they are nervous about the process! This entry was posted in Politics on November 7, 2016 by johnnyjquispe. This past month national attention was given to Flint, Michigan for an inexcusable year of lead contamination to its water source. What occurred in Flint was a failure of responsibility by elected and appointed officials at different levels of government. The result? A city of nearly a hundred thousand (100,000) exposed to unacceptable levels of lead with incalculable damage to their health. Unfortunately, what has been done is done and now the city must invest in infrastructure, health studies, aid to families, and redevelopment in to attempt to do right by its residents. This horrific case must be a wake-up call for the United States, in particular, its older states with antiquated plumbing, infrastructure, and a history of industrial contamination, such as New Jersey. New Jersey, one of the original 13 colonies, the birthplace of the American Industrial Revolution, and now the state with the highest population density in America is in need of a comprehensive approach to overcoming its industrial contamination and probable public health problems. New Jersey has more than 14,000 known contaminated sites (NJDEP) ranging from gas station spills, small historic industrial contamination, to United States Environmental Protection Agency Superfund Sites. Where exactly are these are contaminated sites and who is living by them (See Figure 1)? In a paper published last month the authors found that extreme emitters are likely impacting Environmental Justice (Definition Below) communities even more significantly than we may have previously thought. 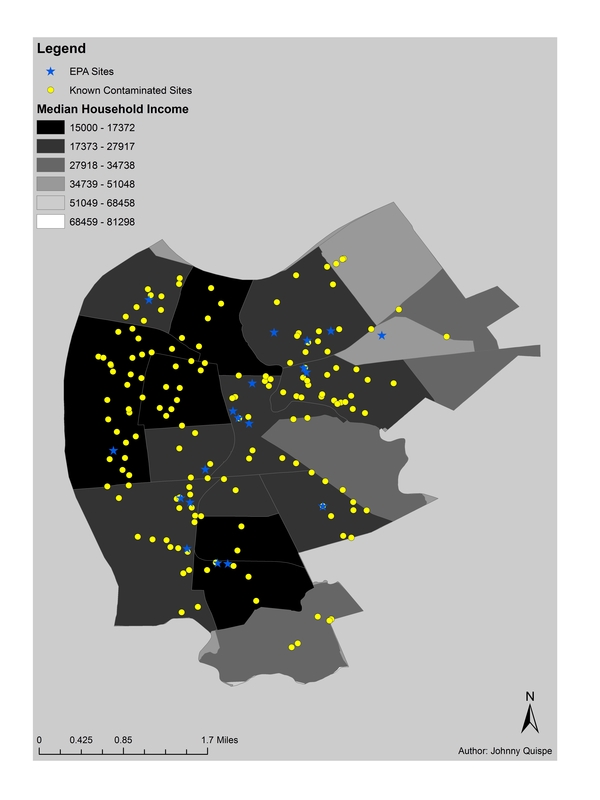 These findings suggest that low-income and minority communities are experiencing a disproportionate exposure to environmental hazards compared to higher-income communities. In New Jersey, oversight for contaminated sites has transferred from NJDEP to private consulting firms with a Licensed Site Remediation Professional (LSRP) in what seemed to be an effort to expedite the process and provide efficient oversight and remediation. This switch followed a vote by the New Jersey State Legislature in 2009 to outsource the work to private firms. It has yet to be seen that this system provides much efficiency since most firms will go for the site with big contracts while other “less popular” and many times more important sites slip between the cracks. Camden and Newark have both had early economic and industrial success throughout the industrial revolution but left to pay the price of business. Over time many of the national corporations that called these cities home have left, crime rates, and poverty levels have increased, making it difficult for redevelopment. 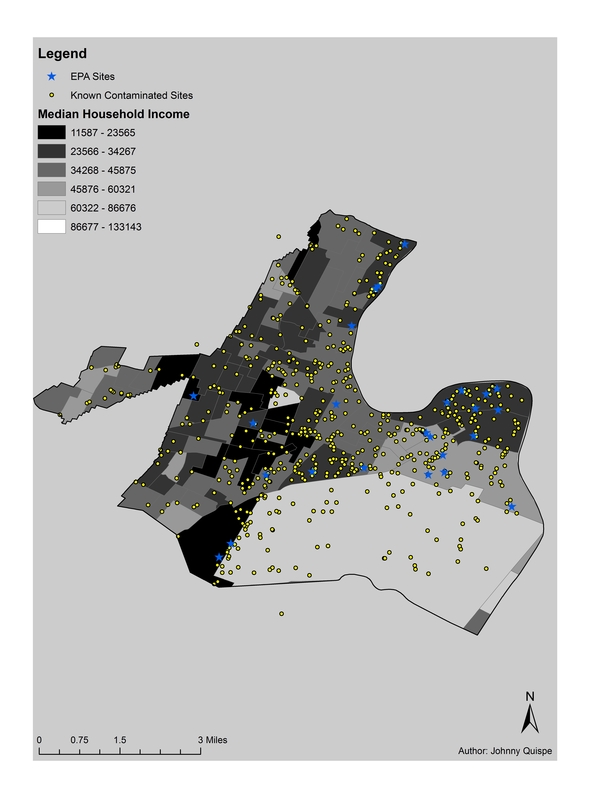 An analysis examining economic and demographics in relation to contaminated sites have shown that areas where the majority of its residents are low-income have more unresolved contaminated sites. For example, in 2002 a school district report for Camden found that 7 public school building were found to have high levels of lead in their water supply stemming from its old piping. 14 years later the school’s water fountains are out of commission and the school district is spending $75,000 a year on bottled water for students. How is it possible that the necessary upgrades have not been completed to provide one of the most essential needs for these students? The recurring slashing of the state budget by Governor Chris Christie has pushed NJDEP to its breaking point with a diminished staff, resources, and a system that is unable to fulfill its duties to the people of New Jersey and the environment. The state is not only to blame since federal spending for USEPA’s Superfund program has been cut repeatedly from its inception in 1996 and its Trust Fund has been depleted since 2003. ( See Figure 6) With around 150 Superfund sites and 113 of these on the National Priority List (NPL) New Jersey is in dire need of funds to remediate and remove these sites from the NPL. Superfund was based on the principle that polluters, not taxpayers, should pay to clean up toxic waste sites not for hardworking American taxpayers to carry the burden for the mishaps of industries that use hazardous substances. These cuts greatly have greatly affected the amount of money USEPA can put towards superfund research, remediation, outreach, and several other indispensable functions of the remediation process. New Jersey’s main cause of lead poisoning comes from old homes and apartment complexes that used lead-based paint. Many of these homes are located within in areas with contaminated sites and low-income communities. In 2004, New Jersey officials created the Lead Hazard Control Assistance Fund (LHCAF) to help allocate resources to inspect houses and apartments, emergency relocations for families, education and the removal of lead from houses and apartments. Since its inception over fifty million dollars has been taken from it to help balance the state’s budget, leaving it with only one hundred and eighty thousand for both this year and next year. In the past year a bill to put ten million dollars into the LHCAF has come across Governor Christie’s desk and he has decided to veto it. This veto leaves thousands of children and families at risk of lead poisoning, many of which do not have the ability to move to another place. The costs of renewing our infrastructure are already well underway and have the potential to be even higher with several detrimental public health implications. New Jersey needs new mandates and to allocate funding into these communities and the essential programs needed to provide the necessary support and protection of human health. The solution isn’t simply to tax the people of New Jersey, rather we must shift back to our polluters pay system, work with developers and homeowners to ensure homes are kept to standards, and implement an adequate system for oversight. Too often are our vulnerable communities put on the frontlines and not looked after. New Jersey must take lead in cleaning up contaminated areas, lead-based paint from homes, and protect our children and vulnerable populations or pay for it with the health of our children. Special Thanks to Stephen Epstein in his help with this post. This entry was posted in Environment, Politics, Social Justice, Water on February 22, 2016 by johnnyjquispe. Happy New Year to all my followers and readers! It has been about a month since my last post, life got a little hectic with the holiday season and me leaving to Boston for half a month to take winter classes. Now, I am finally back and ready to take on my second semester of Graduate School and write some more. While I was away I received some emails with updates regarding the situation going on in Flint, Michigan and could not believe that this was going on right here in the US since 2014. In 2014 Flint, Michigan decided to start drawing its water from the Flint River instead of getting its water from Detroit, MI as an effort to save money. What followed was a series of boil water advisories, complaints about the smell, taste, and appearance of the water, as well as reported rashes and other health related concerns. On September 24th Dr. Mona Hanna Attisha urged Flint to stop using the water from the Flint River after finding high levels of lead in children’s blood. The State of Michigan insisted that the water was safe and disregarded the findings of this study. “The city of Flint under state-appointed emergency management, almost bankrupt … switched their water source from Detroit, which was fresh Great Lakes water source, which we’ve been using for over 50 years, to the local Flint River to save money. “And that local Flint River was innately more corrosive than the Great Lakes water source. And the critical corrosion inhibitor, which is mandatory for all drinking water systems to use … was not added to that water. Flint, like most of the United States has an antiquated piping and plumbing system that hasn’t been updated in ages. While this is a separate problem in and of itself across the country, this is the reason lead has entered the water system. Ever since I could remember my parents and teachers taught me the dangers of lead and the effects it can have on my health yet it seems that state officials may have missed that lesson. There are countless papers with empirical evidence that shows the dangers of lead and how it can affect almost every organ and system in the body.Children, women of childbearing age, and the elderly are especially vulnerable to lead poisoning. Lead poisoning can cause irreversible neurological damage, anaemia, hypertension, and other health complications (WHO). How is it possible that close to 100,000 people were exposed to these conditions and those in charge did not take quicker action? Reasons… Profit, Politics, and a disregard for the poor. This is another gross example of how profit and politics are put before the wellbeing of people. Had this been a city like New York City or Los Angeles this would have been immediately remedied and alternative solutions would be readily available. The constituents of Flint, on the other hand, are not wealthy individuals, instead, they are a group of marginalized working people in need of assistance and without a voice. Unfortunately, I believe that race and poverty are to blame for the lack of response and those who knowingly allowed for this disaster to occur must pay the price. There is simply no justified answer that anyone can provide as to why this problem went on for so long when water sampling, recommendations by doctors, and complaints from residents indicated that the water was not safe to drink. I call for the immediate resignation of all elected officials that stood by and watched as this gross violation of human rights occurred. What has occurred is criminal and should be thoroughly investigated and those involved should be prosecuted for this heinous and incomprehensible disaster. Such negligence and disregard for the well-being of people should not exist in our political system and needs to be done away with. I don’t care if you are white, black, democrat, republican, legal, illegal, rich, poor, or any of the countless divides we have established in our society, but no person should be subjected to having lead or any other contaminants in their water. This should not be an issue of special interest, but one of human rights. Clean water, the most basic of human needs and a right that most of us take for granted should not be a casualty of bureaucracy. While no city or community should have to go though what Flint is going through it should be a stark wake-up call for other cities and communities. City and state officials should not cut corners when it comes to infrastructure and basic necessities like water. It’s about time we invested in our infrastructure in order to avoid disasters such as this one. How many more pipe bursts and disasters will we wait for until we decide it is time to update? It will take some time to actually quantify the damage that has been done in Flint since the damage is not restricted to the physical city but to the health of each individual. I’m sure that in the near future we will learn more about what has happened and the full extent of the damage committed. Figure 4. Percentage of tap water samples with lead above 5 ppm. This entry was posted in Environment, Politics, Social Justice, Water on January 24, 2016 by johnnyjquispe. Last Monday, November 23rd, Kate and I presented our program proposal for a Social Justice Challenge hosted by Rutgers University- Newark School of Public Affairs and Administration (SPAA). Unfortunately, we were not selected as the recipients for the $5,000 prize for the national tract, instead we were selected as the 1st runner-up. Art works was a brainchild formed by us when we were thinking of Social Justice issues affecting youth of low socio-economic status and minority groups. Being from New Jersey and looking to create a local project we selected to use Newark as our area of study and future site for our projects’ pilot area. After several meetings and discarding other ideas we kept coming back to education, particularly public education in inner-cities. It is well known that since the economic crisis of 2008 there have been many local, state, and federal budget cuts on most if not all programs. Some of these being public education and social services. On a national level, staff members, teachers, and schools have been challenged to raise student scores ,standardized testing and completing subject curriculum within 180 days, focus on student development, correcting assignments, to name a few. All while having larger class sizes, dealing with teacher assessments, lack of contracts, and a reduction in funds. Over the past 5 years Newark Public Schools have been losing funding and have had to make adjustments to their programs, often resulting in the reduction of staff, arts, and extracurricular programs. Quality and complete education is a right and not a privilege that must focus on academic development as well as social and cultural growth. The lack of holistic education has created a ripple effect that is negatively impacting communities in Newark. Without quality education and the increasing budget cuts there has been an inverse correlation between education and crime (CD-Index 618.3 vs. USA CD- Index 294.7 ) ,dropout ( ACS 2013 6.2% vs. USA 4.5%) and graduation rates (67.7% US. Department of Education). Studies conducted by the National Endowment for the Arts have shown that youth engaged in high arts regardless of socioeconomic status have higher levels of political engagement, efficacy, and community involvement. These studies show that stronger integration and investment in the arts have a strong correlation to community/civic engagement, high school graduation, college enrollment and achievement. Find the whole report with additional information here. Art works is certainly not the solution for the education reform that needs to occur in Newark, instead it aims to be a low-cost/ high-impact supplement to integrate the arts into education and empower, educate, inform, inspire the under-served population within our society. We hope that we can partner with other like-minded individuals, organizations, and institutions. While we were not able to attain the $5,000 to initially start Art Works we remain hopeful and are looking for other ways to accomplish our goal. We are currently planning to submit an updated proposal to Rutgers University-New Brunswick & Newark and Newark’s Board of Education that will go into more depth of community participation, impact analysis, and overall need for projects such as Art Works. This entry was posted in Art, Education, Social Justice on December 2, 2015 by johnnyjquispe. Welcome to my first blog post! Here I will be sharing and updating the public on some of the projects I am working on and share my general interests. If you don’t already know who I am check out my About me. Thanks for visiting and hope you enjoy the content I put up here! So back in September a professor of mine told me to submit a proposal for a Social Justice Challenge hosted by Rutgers University- Newark School of Public Affairs and Administration (SPAA). I asked a friend of mine, Kate, if she was willing to join me on putting forth a proposal and luckily she said yes. On October 30th we were notified that our proposal was accepted for the National Tract and we were 1 of 4 finalists who will be competing for the seed money ($5,000) to get our project started. It is our hope that our project will be selected as the winner so that we can start our project in Newark and then implement our program in other cities across the country. Posted below is the abstract for our program and after November 23rd I’ll post the complete proposal and timeline. How do you see Newark? Our themes along with the variety of art forms used will be used to aid in constructive expressive art that captures what residents hope to see happen within their communities, share their struggles, communicate ideas thus providing empowerment and increasing efficacy. Art Works will achieve its goal though engagement and active cooperation with the city of Newark, local non-profits, teachers, university students, community leaders, and other volunteers. Looking to get some feedback we created a short survey online asking our networks about their interest in participating and their experience with different artistic mediums. Out of curiosity for more public feedback on social justice issues, we ended the survey with an open ended question asking “What do you think is the greatest challenge facing urban communities today?” Below is an image that shows the most used words(larger words-more frequent & smaller words- less frequent). If you are interested in seeing our presentation you can view it on Monday November 23rd at 10:30 am as we present it to a panel of Social Justice professionals and a chance at $5,000. Register by clicking here. If you have any further questions or comments feel free to leave a comment or send me an e-mail. This entry was posted in Art, Education, Social Justice on November 21, 2015 by johnnyjquispe.